Ballyclare Comrades sent out a New Year’s statement on Friday night with a resounding 5-1 Championship win over fifth placed Dergview. A brace from Thomas Robinson as well as goals from Dean Youle, Corey McMullan and Chris Trussell sealed the victory at Dixon Park to send the Comrades ahead of Institute and back into second. In an evenly matched first half, Comrades grabbed the only goal. In the 35th minute, Thomas Robinson cut into the box and hit a fine low shot wide of the keeper and inside the far post from 17 yards. The second half belonged to the home side. They increased their lead on 52 minutes, when Dean Youle headed in from three yards, after getting on the end of a Mark Shannon free-kick. 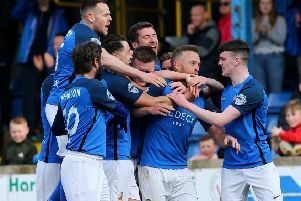 Thomas Robinson got his second goal in the 59th minute, when he ran onto a pass from Michael O’Hanlon to smash the ball into the back of the net from 13 yards. The visitors briefly threatened a comeback when they pulled a goal back on 72 minutes. A free-kick into the box broke to Aaron Arkinson, who swept the ball home from four yards. However, Comrades reasserted their dominance and two late goals sealed a big win. Firstly, on 85 minutes, a bizarre goal from Corey McMullan came when he blocked a counter-attack and the ball flew back over the head of the stranded goalkeeper from 40 yards out. Then, two minutes into injury-time, Chris Trussell surged to the corner of the six-yard box before firing the ball in at the near post.